U.S. Navy. Via Merriam (2006). 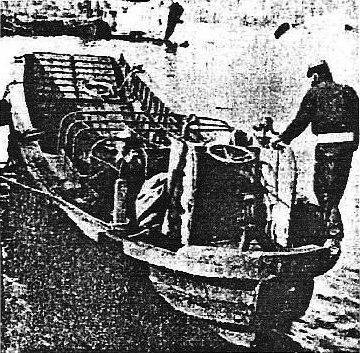 42'8" by 9'6" by 2'7"
The Chuhatsu or 13m landing craft was a smaller version of the Daihatsu used by the Japanese Navy. It resembled the Allied LCVP, with a bow ramp that was lowered on hitting the beach. It was used as a ship's boat for cruisers and for transporting aircraft.